Find the best deals on coding robots for Black Friday 2018 including the Wonder Workshop Dot and Dash, Sphero SPRK Edition, Lego Mindstorms EV3, UBTECH Jimu and more. 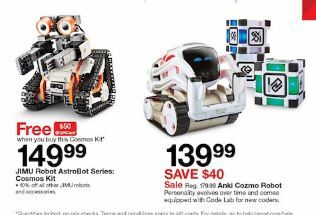 The coding robot is going to a hot item Black Friday and Cyber Monday 2018. We will be watching for the best deals in print and online to kick start the 2018 holiday. This a great STEM (Science Technology Engineering and Mathematics) learning tool and we expect it to an item you should purchase early this year if you plan to give these toys as a Christmas Gift. The Root Coding Robot has a tremendous amount of functionality 50 sensors and actuators. It can drive around on its own and use the front sensors to make sure it does not fall of the edge of a table. It has the ability to pick and put down a marker, so it can make some interesting drawings. It can do color scans using its internal sensor. It can also climb magnetic surfaces (such as a white boards). It has touch sensors and accelerometer which react to both touch and motion. Another neat feature is that the Root can erase its own on a white board or the provided grid. Root Robotics has also indicated that they will be adding accessories, but we don’t expect them by Black Friday 2018. Expected Price and Black Friday Savings: The Root is currently priced at $199 which includes; the Root Robot, Foldout whiteboard grid, Vinyl Cling pack (used for games and other activities), charging cable and two dry erase markers. While they are currently backordered, we except there to be a huge push this Thanksgiving. Responding to voice, navigating objects, dancing, and singing, Dash is the robot you always dreamed of having. Kids design behaviors and interactions for the real robot Dash and their coding companion Dot, that provide them with personality and intelligence. Designed to inspire curiosity, creativity, and invention through connected play and coding. Teach your robot simple commands like roll, flip, spin, and color. Create more complex instructions for your robot to follow as well. A coding robot toy is a great STEM learning tool and will certainly be popular. We expect they will sell out very quickly on Black Friday and won’t be any in stock by Cyber Monday. Given how new the company and how quickly the first round of Roots sold out, we think they may offer pre-orders deals for Black Friday and Cyber Monday 2018. We will be keeping a close eye on the stock levels and deal for coding robots before Black Friday 2018, so you don’t have to.